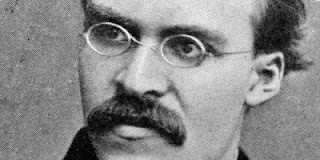 Nietzsche, moments after God shouted "Nietzsche is dead!" "...because in our time Nietzsche shouted 'God is dead' there are no generally accepted values, no universally valid systems, no publicly meaningful hierarchies. Without them all experience becomes equally serious or equally ludicrous." -Robert Corrigan in Comedy; Meaning and Form. One might add equally 'good' or equally 'bad,' in that there is no longer one accepted perspective to judge these things by. This is, of course, both a good and a bad thing. In relation to poetry, this is why nothing is no damn good nomore and everything is often always bad. And if you think otherwise well then you're right too!